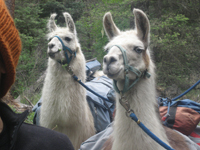 Llama Trekking Adventures in New Mexico's Pristine Wilderness! Wild Earth Llama Adventures offers educational multi-day llama trekking adventures and gourmet lunch day hikes in the seldom visited wilderness areas of New Mexico's Sangre de Cristo Mountains and Rio Grande Gorge, near Taos and Santa Fe. What's llama trekking? Llama trekking is hiking and camping in New Mexico's pristine wilderness, with a woolly hiking buddy and knowledgeable wilderness guide. Our gentle, sure-footed llamas carry the gear, so you are free to enjoy the scenic beauty and inspiring solitude of New Mexico's unspoiled wilderness. Our experienced naturalist guides will enrich your llama trekking eco-adventure with their extensive knowledge of local ecology, including: native plants and wildlife; edible and medicinal plants; natural and cultural history; and wilderness living skills. Our years of experience as New Mexico's Premiere Llama Trekking Outfitter, exploring and seeking out the "hidden gems" of the Southern Rockies, enable us to work with you to create a custom designed llama trekking wilderness adventure for any age or fitness level. 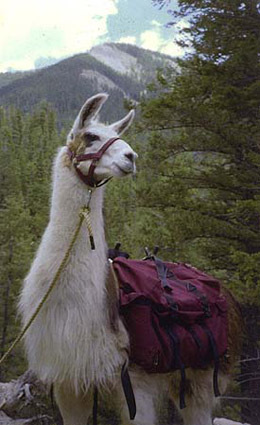 We are committed to outfitting you with a safe, educational llama trekking adventure. Join us for a single day escape, or a multi-day wilderness adventure. 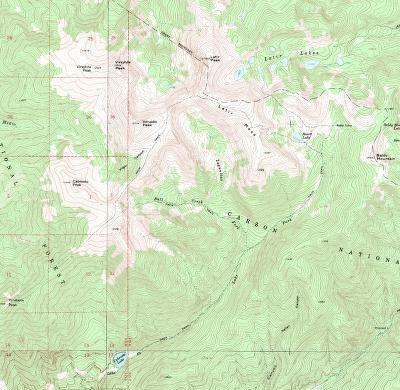 Our friendly, knowledgeable guides and "llovable" llamas will help you create the wilderness experience of a lifetime. Please browse our site, and give us a call with any questions. We look forward to llama trekking with you in the diverse wilderness enviroments of northern New Mexico and the Southern Rockies. As a service to our llama trekking guests, we have recently created a Taos Outdoor Recreation page and a Taos Lodging page; to help you plan your New Mexico adventure vacation. We have also added a Taos Weather page, so you can check in with us to get an idea of current local conditions, prior to your single or multi-day llama trekking eco-adventure with us into New Mexico's pristine wilderness. Please call us to answer any questions, or to make reservations. Wild Earth Llama Adventures operates in a unique partnership with the USFS, BLM, and regional wilderness advocacy groups to promote conservation and stewardship of our public wild lands. Copyright © 1993-2019, Wild Earth, Inc. All rights reserved.